Synonymous with All-American style, Tommy Hilfiger is a household name, and his clothes are a household staple. Long before he built his famous fashion empire, Hilfiger owned shops in upstate New York selling other people’s designs. It wasn’t until he moved down to New York City and started designing that he saw huge success across the country and became world-famous for his brand that honed in on classic American style. Today, the Hilfiger brand is an international sensation, allowing the designer to collect many valuable timepieces. His company even partnered with Hugo Boss a few years back to create a ‘smart watch’. But, you won’t see the designer wearing that. In fact, we recently spotted Hilfiger sporting a spectacular two-tone Rolex Yachtmaster II 116681. When a designer of Hilfiger’s caliber sports a watch, you know it’s a good one. Tommy Hilfiger has a two-tone Yacht-Master II. What’s on Tommy Hilfiger’s wrist? 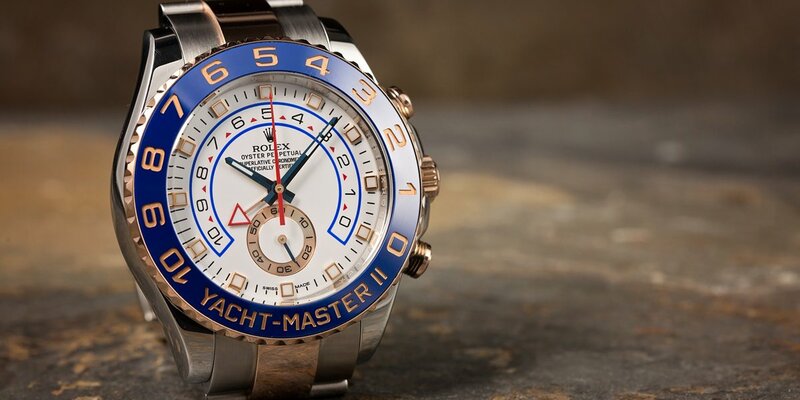 The Yachtmaster is amongst the top watches crafted by Rolex — often revered for both its design and durability. But, the two-tone Rolex Yachtmaster II 116681 is even more outstanding than its counterparts because of all its upgrades. Firstly, we should look at this bigger, 44mm case that can accommodate that new 4161 caliber perpetual movement. This model also comes with the improved ring command bezel and a Paramagnetic blue Parachrom hairspring. Then there’s the face — the dial is outfitted with a brand new design, putting the square Chromalight hour markers and a countdown function front and center. Surrounding it is the blue Cerachrom bezel with 60-minute graduations and the name ‘Yacht-Master’ etched in matching rose gold. And like the previous models, this timepiece boasts the scratch-resistant sapphire crystal and can reach depths of up to 330 feet. Finally, we can’t ignore the two-toned case and bracelet. The rose gold, or as Rolex likes to call it, everose, pops against the stainless steel case and links. Today, we typically think of the patented Rolex rose gold as a feminine touch, but it’s been used in men’s watches for decades — and we think it’s a timeless classic. Plus, that pink and golden color really pops against that cobalt blue on the bezel — giving this Yacht-Master II 116681 a stylish and dignified feel. 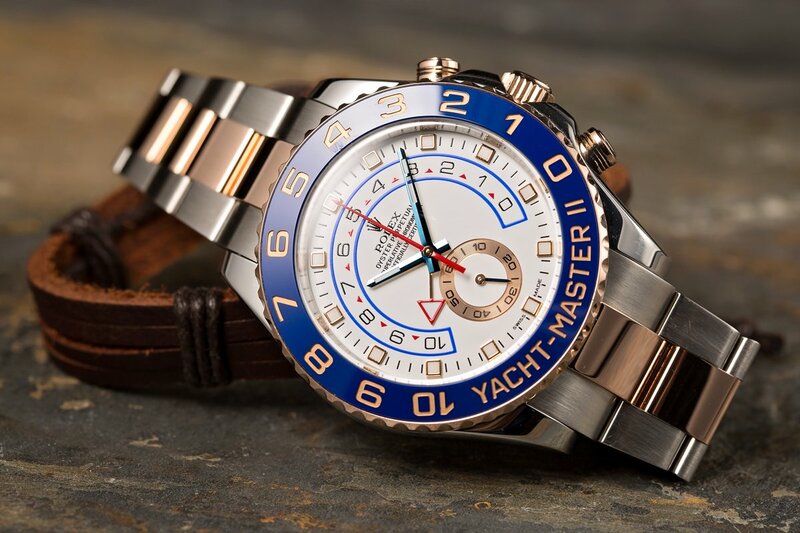 Would you wear the Yacht-Master II as a two-tone or have one metal. At Bob’s, we have some stunning examples of the Yacht-Master II stored away in our vault and on display on our website. Take a look around to see more pictures of the reference number 116681, or a two-toned 16623 featuring yellow gold, or even a sterling silver 16622 featuring a platinum bezel and blue face. Because while Yacht-Master might look great on Tommy Hilfiger’s wrist, we think we can find one that will look even better on yours.